A magnitude 4.3 moderate Vancouver Island earthquake and a magnitude 4.4 moderate San Bernardino earthquake impact the Pacific Northwest before 2015 ends. The magnitude 4.7 Vancouver Island earthquake and the magnitude 4.4 San Bernardino earthquake are deep enough to cause no casualties and to generate no tsunamis, according to announcements on Tuesday, Dec. 29, 2015. Earthquakes Canada broadcasts the earthquake of 11:39 p.m. Pacific Standard Time at 4.3, then 4.7 magnitude, lower than the U.S. Geological Survey’s determination of magnitude 4.8. Earthquakes Canada confirms the ten-second earthquake’s epicenter as 19 kilometers (11.81 miles) northeast of the capital city, Victoria, and 8 kilometers (4.97 miles) east-southeast of Sidney. Twitter’s eyewitness tweets describe the no-casualties, no-injuries impacts of rattling windows, shaking houses, and shifting ground from Vancouver Island to Chilliwack, Kelowna, Maple Ridge, and Penticton. BC Hydro effectuates undisrupted electrical system service. Seismologists with Earthquakes Canada and Natural Resources Canada find the earthquake occurring at a below-surface depth of 58.7 kilometers (36.48 miles) under the Strait of Georgia. Alison Bird, Earthquakes Canada seismologist and Vancouver resident, indicates depth’s importance in geo-physical terms since the offshore Juan de Fuca oceanic plate rarely generates major aftershocks. She judges clicking Earthquakes Canada’s “Did you feel it?” button as particularly important. Seismologists with the U.S. Geological Survey know of more than 11,000 reports by residents of feeling the impact of British Columbia’s quake throughout northwest Washington state. USGS seismologists note the same-day, 3-mile-deep (4.83-kilometer-deep), magnitude 4.4 San Bernardino earthquake near Cucamonga, San Andreas, and San Jacinto Faults at 5:48 p.m. Pacific Standard Time. The epicenter originates 2.48 miles (4 kilometers) outside Devore in San Bernardino County. San Bernardino’s evening earthquake provokes magnitude 3.2 and 3.8 aftershocks within the first minutes and a dozen tiny tremors until just before Vancouver Island’s night-time earthquake. Officials qualify the San Bernardino and Vancouver Island earthquakes as wake-up calls because of respective proximity to the mega-earthquake-producing San Andreas Fault and Cascadia Subduction Zone. No extreme aftereffects remain other than news of Metro Vancouver’s SkyTrain Expo and Millennium lines’ 90-minute-long shutdown to verify the guideway’s safety and tweets of temblors. FEMA poster 529 (9/2014) depicts a teacher and students in a classroom responding appropriately to first sign of an earthquake (Drop, Cover, and Hold On). Chan, Kenneth. 29 December 2015. “(UPDATED) Magnitude 4.3 Earthquake Felt in Vancouver.” VanCity Buzz > Trending. Crawford, Tiffany. 30 December 2015. “Moderate Earthquake That Struck Near Saanich Felt Across Lower Mainland.” The Vancouver Sun > News. “Did You Feel It? 4.3 Magnitude Earthquake Hits Near Victoria, B.C.” Kiro TV > News > December 30, 2015. Edmiston, Jake; and Postmedia News. 30 December 2015. “B.C. 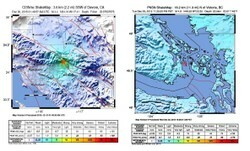 Earthquake Shakes Victoria and Vancouver Area: Buildings Rattle But No Damage Reported.” National Post > News > Canada. “Here’s a Look at 5 of the Largest Earthquakes to Strike B.C.” Global News > Canada > December 30, 2015. Leung, Roberta. 30 December 2015. “Magnitude 4.3 Earthquake Felt off B.C.’s Coast.” FigMedia > News. Lum, Zi-Ann. 30 December 2015. “Victoria Earthquake Callers Prompt Police to Issue PSA About Using 911.” The Huffington Post > Edition> Canada > British Columbia. “Magnitude-4.4 Earthquake Shakes Southern California Suburbs.” Globe Gazette > News > National > December 30, 2015. McElroy, Justin; and Talmazan, Yuliya. 30 December 2015. “No Damage, Injuries Reported After Earthquake Rattles B.C.’s South Coast.” Global News > Canada > British Columbia. Nagel, Jeff. 30 December 2015. “Earthquake Jolts B.C., Lights up Social Media.” Tri-City News > News. “No Damage After Moderate Earthquake Strikes B.C.’s South Coast.” CTV News > December 30, 2015. “Quake of 4.8 Magnitude Hits Near Vancouver Island, Felt on North Olympic Peninsula.” Peninsula Daily News > News > December 30, 2015. The Canadian Press. 30 December 2015. “Homes Shake, Residents Unnerved, But No Damage from Moderate B.C. Quake.” Yahoo! News Network > Yahoo News Canada. Thompson, Jerry. 2011. Cascadia’ Fault: The Earthquake and Tsunami That Could Devastate North America. Berkeley, CA: Counterpoint Press. Matheson, Darcy Wintonyk; and Weichel, Andrew. 30 December 2015. “Overnight Quake the Strongest Felt in 14 Years on B.C.’s South Coast.” CTV News Vancouver > News. In early morning hours, Wednesday, Dec. 30, 2015, transit security officers make rounds outside of Vancouver, B.C. 's Commercial-Broadway Skytrain station, checking for possible damage to elevated guideways from Tuesday night's earthquake. FirstOnSite tweets Jan. 4, 2016: "Vancouver had a shaky end to 2015 when a 4.7 magnitude #earthquake hit the west coast: http://bit.ly/1O6lSQN via @globeandmail"
frankbeswick, Is it a case of the unknown earthquake casualty or is the person's name known? I've been through two, one in Utah and another in Virginia (about which I wrote for Wizzley). In both cases, the floor moved back and forth quickly under my feet, almost like the experience of skating backward and forward. Britain does not suffer very bad quakes, I have only personally experienced three, the worst being a magnitude 2, which was part of an earthquake cluster of mainly magnitude ones, though we have had larger. No one was hurt, in fact Britain's recorded death toll from quakes is one, in the eighteenth century. Cumbre Vieja will cause Atlantic-wide problems, but when we don't now. However, by the time the wave hits Britain it will have diminished in size, and it is Eastern America that will take the brunt. Our South Coast has cliffs that can take a direct hit. But any tsunami coming from the South West will vary in its effects according to the varying sea bed and coastal conditions that it meets on its way. frankbeswick, Yikes! I hope that the United Kingdom has effective earthquake and tsunami preparedness. Speaking of Krakatoa, did you know that some scientists believe that the sky in Edvard Munch's The Scream art work reflects the influence of that volcanic eruption on Oslo's skies? There's a recent alternate interpretation of it as mother-of-pearl cloud configurations in an article by Mariëtte Le Roux, Weird Clouds May Have Inspired 'The Scream,' for Phys.Org April 24, 2017. It is not widely known that the tsunami from Krakatoa hit Britain. Ok, by that time it was 4 centimetres high, but it was measured. I have thought about the issue and am concerned that any shock might cause Cumbre Vieja, a volcanic island off Africa, to have a submarine landslide, which will cause tsunamis to hit the Eastern USA and the coast of Britain.Some time in the next ten thousand years it will happen, but I can wait. But it could happen any time, and I have a daughter who dwells near the coast in West Britain. frankbeswick, Amen! It's a scary scenario if all the weak points from coastal and offshore Canada, the United States and Mexico become actively problematic at the same time and if area nuclear power stations find their back-ups failing like Fukushima's did. A mega-quake would have repercussions across the whole Pacific region, possibly with world wide implications. CruiseReady, The truly scary version is a mega-earthquake that runs from coastal North America down through Central America! Amazing information, DerdriuMarriner ! I never would have guessed those areas as quake prone, either. (An uncle and aunt lived through the Alaska one when I was quite young.) Hopefully, one day, we'll find out how to predict the big ones ahead of bime. It's their sudden and unforecast onset that makes them far more terrifying than hurricanes, I think. blackspanielgallery, Most geophysicists did not think of Vancouver and the Pacific Northwest as other than a seismically quiet area until geologists who were not trained in earthquakes but who brought a fresh look to their study started examining the great Alaska and Mexico earthquakes of the previous century. Now they're all talking about when the Cascadia Subduction Zone is going to produce the Big One and whether it will be a partial or a full rupture with the latter possibly involving faults from California through Central America. I have never guessed Vancouver has earthquakes. Cascadia’s Fault by Jerry Thompson shows that America’s earthquake and tsunami may devastate the Pacific Northwest in the twenty-first century. The surprise earthquake in Mineral, Virginia, near Richmond, on August 23, 2011, brought attention to the state's little known, generally mild earthquake zones.